Showing results for tags 'friendship'. Those of Ponyville that had been caught amidst the game to participate would find that their powers or natural talents have been reversed and to those fallen into the game would receive a set of instructions to find Discord and retrieve a scavenger hunt list. Finding their items and using them properly would return their magic and talents and earn them a grand prize, courtesy of the god of chaos. Over their cutie marks a big red X would be plastered on their flank and they would be provided with a saddlebag to carry the collected objects. Discord was lounged over the portal on his throne, perfectly between Canterlot and Ponyville, sipping jello out of a coconut with a tiny drink umbrella in his eyebrows. I know I've been gone for a super long time, everypony. I can't go into reasons here; maybe in my blog. But the point is I'm back, and I'd love to make some friends! Of course, I'll make a character and roleplay eventually. Soon, in fact. But first, have I missed anything super important in my absence? Here's what I know. The CMC finally got their cutie marks. Flurry Heart exists. The family of Twilight Sparkle, Pinkie Pie, and Fluttershy got revealed. Spike has wings now. You know, I like to write. Whether its to better my own roleplaying style or perhaps I like to create fun little stories. I often write to keep my skills up or when critique comes along, I use it to better myself too. So please if you think something is bad, please tell me. I can't improve myself until I have an outside perspective. However, if you think it's good enough, maybe I will make a roleplay surrounding this idea. So give it a quick read. It won't be a long one...that I can make no promises, I do tend to get carried away. ^^' So this idea revolves around my OC, Astral Star and Spike the Dragon. Of course this isn't canon although their relationship had developed a long time ago for years, a rather slow burn until the two became inseparable. Here's one of their adventures together shortly after Astral temporarily leaves Princess Luna's employ in the Night Court. As the title suggest it's in the surrounding tundra around the Crystal Empire where Astral does find something very peculiar after looking through old records before King Sombra's reign of the Crystal Empire. Without giving it away, Let'sa Go~! Hello to anyone reading this! I am very new to this site, and I would like to start off an idea of an rp that's been in my mind for some time. While this is an rp in the FFA category, I would like it (and need) for anyone to play the roles of the mane six (plus Starlight Glimmer) and Princesses. Here's a brief overview of what's going on. A self-aware, semi-organic robot by the name of Gabriel was trying to escape from a pursuit with his creator and adopted mother, Eleanor. They were being chased by members of an organization that previously supported her scientific projects; such as trans-dimensional travel. Desperate on trying to find a way to get away from their pursuers, Eleanor activated a portal that was still under construction, and attempted to input a trajectory that would only "teleport" them to a random location outside of the facility they were in. Unfortunately, due to the portal's framework still incomplete, it didn't work the way neither of them wanted. This forced the two to become separated from each other, and end up somewhere in Equestria.Now, separated from his best friend and closest thing he has as a mother, he is alone and desperate to reuniting with her as he is trapped in a random location in Equestria; close to Canterlot. So, anypony interested? I'd appreciate the help. 1 Year Anniversary and 2,000 Posts!!! Can you believe it? I've been on here for a whole year now! I've had some good times, some great times, and some...interesting times. I've made a whole lot of friends. Creeped an IRL friend out (with the fact that I have so many online adult friends). Got two IRL friends to join the site (and then they both left). And welcomed a whole lot of people. I roleplayed a lot of roleplays, and got myself a Skype to roleplay even more! In this past year: -I got 7 of my OC's approved -I apped and am now an active player of Starlight Glimmer -I discovered making troll accounts and playing the same prank on your friend 4 times still works -I realized going on pony sites the night before your exam is not the same as studying -I learned the basics of speaking spanish -I learned a bunch of useless information of the Biological Kingdoms and Classification -I learned around (Eleven?) different chemical reactions -I continued to really hate math -I realized that, yes, it is possible to go from a literal fail to a perfect in essay writing (Maybe because roleplaying helped improve my writing skills?) -I received a microphone and realized I sound really bad on recording -I received a drawing tablet and realize I can actually draw -I learned the basics of economics -I learned how to cut a tree (Make an undercut. Make a back cut.) -I learned fishing boats. I can name 5 types (Gill net, purse seine, longline, trawl, otter trawl) -I realized that I have enough drama in my life that I don't need to watch reality TV shows -I started reading the news. -I made friends with my basic polar opposite (and we're bff's to date) -I don't actually know if this blog counts as a post. -I realized I should stop welcoming new members by pm (nothing good's ever come out of that) and leave somebody else to that job -I started watching anime other than Tokyo Mew Mew -I listened to Kpop and realized it;s not half bad. -I lost all the bets I made this year with my friends. -I knit about 7 more lines to my scarf. The same scarf that I've been knitting for 3 years (granted, I knit an average of 3 lines per year) -I realized that the death of a family member isn't always bad (you have to be thankful they lived for that long) -I learned that being passive-aggressive sometimes does you good -I really like the 'delete' and 'edit' button. -My online friends mean as much to me as my IRL friends -I have no idea how this list got so long. -I learned two things about two members that I probably could have learned if I just read their profile. Instead, it took about 12 months and a bunch of pm's. -There's a lot more than happened this year, but (a) I'm too lazy to make this list even longer (b) My memory is lapsing right now because I'm desperately trying to study at the same time. (c) Srsly people. I love to rp. This isn't really a reason, but I'm just being my random self again. Thanks for all the good times, guys~ And let's make many more! , Lyi Ps. I am not LYIPH. I am not a leaf. Please. The only way I can pronounce LYIPH is leaf. Pps. Lyipheoryia. Lie-i-fee-ore-ee-a. Lyi. Lee. Don't ask me why my nickname is pronounced differently from my first name. I don't know. The Hearts and Hooves Day Party Boat is Getting Ready to Set Sail! The count down to Hearts and Hooves Day has begun! (At least on Pinkie's watch) Are you ready to party? Pinkie Pie style! Join the biggest bash of the season! Pinkie Pie's party boat! Music, dancing, food, games, and all the super duper fun stuff a cruise ship has to offer! I even got the famous to DJ the event! Woo! Please use this thread as an RSVP for the event. Sign up a single, a couple, or any pony looking for a party. Use as many characters as you'd like just make sure you can RP all the characters you bring. More details will be added to this post as the time to set sail gets closer. Single and ready to mingle: 1. 2. 3. 4. 5. Party Pony Couples: 1. 2. 3. Starry Requiem gave a sigh as she picked up her drink. She was her, on the drearily sunny Ponyville day, to meet an old friend. They had re-met a few weeks earlier at a conference, and she had not hesitated in the slightest to gain his contacts. Philly...that was his old nickname. She gave a smile, fondly recalling memories, and took a sip of her drink. Maybe he would arrive soon? Zeke, a nineteen-year-old college student and his roomates could barely live with the anticipation of traveling to a newfound land over summer vacation. They had heard in the news about how a group of explorers had discovered this new land, and decided to explore it for themselves. After eagerly packing their belongings, they slept their way through an oversea airplane ride that lasted nearly three days long. Once they had arrived at the colorful country that seemed to be teeming with life, they set up camp in a nearby forest, barely able to sleep. The next day, the three participated in a guided tour, learning about what had been discovered about the land so far. While this was going on, though, Zeke's two roomates hatched a cruel plan to ditch the boy in the wilderness, only seeming to be a harmless prank. However, while the two boys were laughing and joking about it, Zeke was wandering around the forest, unable to make it back to the group without the proper guidance. There was also one little aspect that stacked the odds against him... Zeke had lost his sight in an accident when he was five, and was now more vulnerable than ever. Hi! I know from personal experience that sometimes you just need somepony to talk to, or vent. Well, I am NOT a licensed councilor, but I believe that my place in the world is to help ponies (and other species ^^). So, If you need a wing to cry on, an ear lended, or just sompony to talk to, I am here! Office hours: 9:00 am (PT) to 3:00 pm, Monday thru Friday. Please PM me if you want to talk, or even request my Skype! OOC: And here we have my second attempt at a One Piece x My Little Pony: Friendship is Magic crossover focused on new kinds of adventures in Ponyville when a peculiar being from Canterlot decides to leave his life of class behind to experience a more quite and peaceful aspect of the world. And now, on to the starter! IC: A fine daylight sky sweeps the air far above the small town of ponies with a brilliant gleaming yellow sun that promises clear skies for this day and night. The trees surrounding it merrily swaying with the subtley changing directions of the gentle breeze. The scene settles around the presence of a calm and collected male Earth Pony with a gentle trot along borders of the peaceful farm area of Sweet Apple Acres. His full coat having a shade of blue slightly brighter than that of the beloved Princess Luna, and his bright and smooth blonde mane almost as bright as the sun, and his eyes a brighter blue than his main coat. Finalizing his appearance is his cutie mark that consists of a fork and knife positioned in a cross that forms an "X". He seems not to smile, but not frown either, as the currently calm stallion trots ever closer to the bounds of Ponyville; looking forward to a future line of work in a more quiet, a more peaceful environment. White Cloud slowly trotted into Sugar Cube Corner after a long day of working in Ponyville's gardens. The day was rather warm, and after working outside he felt that maybe a nice malt would help to cool him off. It also might help to temporarily make him a little happier. As he trotted up to the counter, he saw Mr. Cake was manning the only pony around. "One chocolate malt, please." He said as he laid 2 bits on the counter. Mr. Cake nodded and began to make the drink. White Cloud looked around and saw nopony in sight other than Mr. Cake. It must be a slow day today. After a few minutes, Mr. Cake set White Cloud's malt on the counter and scooped up the two bits. He picked up his malt and headed over to a corner booth. As he sat down, his mind began to think about how lonely he was. If only I was more assertive, then I might have some friends. Oh, why do I have to be so shy? I'm writing an adventure story with Princess Celestia as the hero. If that sounds like your kind of thing, please come check it out. Celestia in Excelsis Find out how an ordinary unicorn filly became an alicorn princess, the strange origin of her sister Luna, the fate of Starswirl the Bearded, how the Elements of Harmony were discovered, and how Celestia and Luna lost their connection to them. And much more. It's a thousand years of adventure, magic, and romance, all leading to Princess Celestia's ultimate destiny! Thanks for reading. MorningDawn sat in the cold trashcan he called his home. His was left to survive on his own, out in ManeHatten. He huddled up in fear wondering why his parents had done this. He popped his head out of the trashcan and found a hoodie lying on the ground. He grabbed the hoodie and put it on. At least now his little body can be warm in this freezing weather. After lying in the corner for hours thinking what he would do, he walked out of the alley and started walking in the direction of a beautiful rainbow. He thought that it would lead him to his destiny, so after a while of walking he reached a small town call PonyVille. MorningDawn was looking at the rainbow and walked into a cave. He walked out of the cave confused and when he walked back into town he found a small farmhouse. He decided to hop into the barn and take a small nap, just for a little bit. He closed his eyes and dreamed of a better day. Lady was bustling about for the visitor that was to arrive any minute now! All the farm chores were tended to, the apples bucked, the store front closed, and the house smelling of delicious baked goods! The guest bedroom in the airy loft had been cleaned to perfection! Overall she was ready for her visitor to arrive, and what an unlikely house-guest it was indeed! That Gryphon whom everyone else seemed to dislike at the Iron Pony event had seemed to get along beautifully with Lady and a friendship was in bud between them, which was strange because Lady was a very pretty and proper pony, not to mention an earth one to boot, so it was strange that a cocky gryphon and a polite earth pony seemed to mesh together so well. Maybe it was opposite forces attracting, maybe it was the fact that Lady didn't scold her like a child, or maybe it was some form of destiny linking the two together... one could never be sure but the two had hit it off and now that the event was over Lady was looking forward to Gilda's visit! Since they were near Canterlot she had gotten them two tickets to an airshow that she was sure Gilda would love! It was for an all gryphon flying team and they were very hard to get! After that she figured they'd just relax and do whatever they wanted. "I hope she likes it here" She said to herself. Since Trixie has been partially confirmed to appear in Season 3 in one way or another what if there was an episode where she wanted the friendship and forgiveness of everyone in Ponyville including Twilight Sparkle and the other five members of The Mane Six but they all agree that she has to earn it so they give her a series of test to prove that she has changed? I asked a little while back which of two poses would work well for the banner, and this was the pose chosen; however when all was said and done I realize I could have both poses in and still have at least 50% of the base of the banner for text. Anyway for the pose people like more, I made it a small standalone pic with an added background (the actual banner background is transparent so the background color for the site can be seen). Even though this is to celebrate February and by proxy its main theme of Valentine's Day; I don't see this as a ship pic or them as a ship couple. 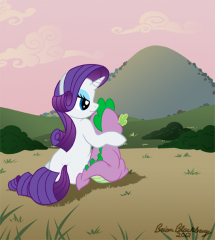 Instead I see Rarity caring for him deeply as a friend, and while she is aware of his crush on her and does not feel the same way, she can still always be there for him whenever he needs a shoulder to cry on or whatever. She is generosity after all. So I'm auditioning as a voice actor for a little MLP:FiM fanimation series, and so I thought I'd share my [very short] reels with everypony. Let me know what you think, improvements, etc. Also, this thread is now a place to post voice impressions of all kinds.